Dylan Melisaratos didn’t get a chance to get to know his uncle Christopher Quackenbush ’79 in person. He was only a year and a half old when the airplanes hijacked by terrorists hit the World Trade Center where his uncle was working on Sept. 11, 2001. 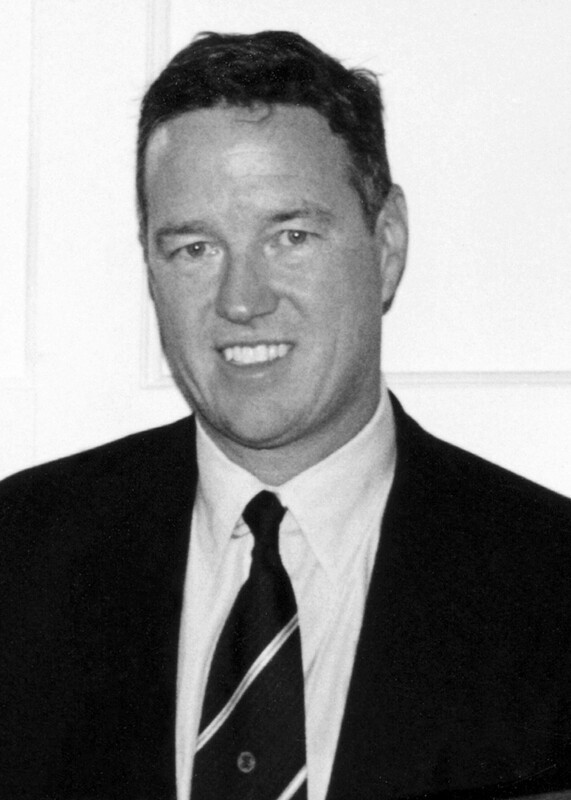 Quackenbush, a founder of the investment banking firm Sandler O’Neill & Partners, has been described by his brother Michael ’77 as “a man who wore Armani suits and wore Santa suits,” because he was known for leveraging his success in business for his charity work. He had set up a charity named for Ebenezer Scrooge’s partner and tutor in the importance of generosity, the Jacob Marley Foundation, which each year took 600 kids who might not otherwise have had the opportunity to Shea Stadium for a Mets game. And this year — after “years of brainwashing and constant reminders about never mentioning Duke around our family” — Melisaratos also embraced his uncle’s and other family members’ Carolina legacy, entering with the class of 2022. “In addition to my two cousins, my mother, three uncles, grandfather, grandmother and great-grandfather, who all attended UNC, I am glad that I am able to carry on my family’s legacy here, and more importantly, carry on my uncle’s legacy in the community that he so very much valued and loved,” Melisaratos told those gathered Tuesday morning for UNC’s annual remembrance ceremony for the six alumni killed in the 9/11 attacks. The ceremony at the 9/11 Memorial Garden near the George Watts Hill Alumni Center takes place each Sept. 11 between 8:46 and 9:03 a.m., the times when the hijacked planes hit the two World Trade Center towers. 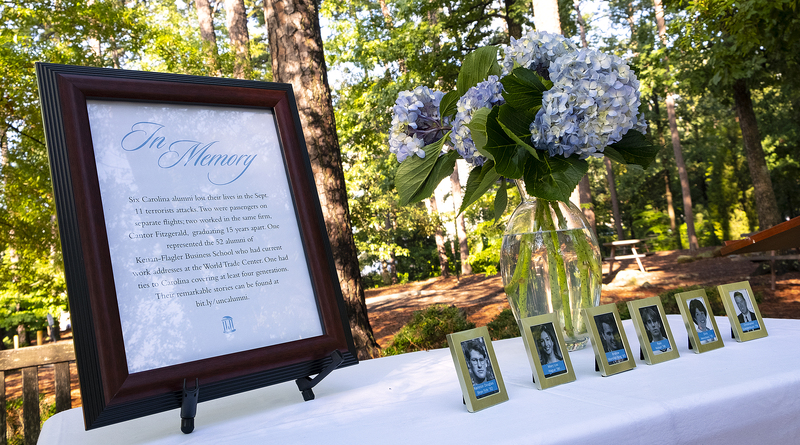 The memorial — a gift from the class of 2005, which had just entered UNC when the tragedy took place — is framed by a rectangle of low stone walls with a plaque bearing the names of the lost alumni: Karleton Fyfe ’92, Mary Lou Hague ’96, Andrew King ’83, Ryan Kohart ’98, Dora Menchaca ’78 (MSPH) and Christopher Quackenbush ’79. In recent years, GAA President Doug Dibbert ’70 has shared families’ and friends’ remembrances of their loved ones. 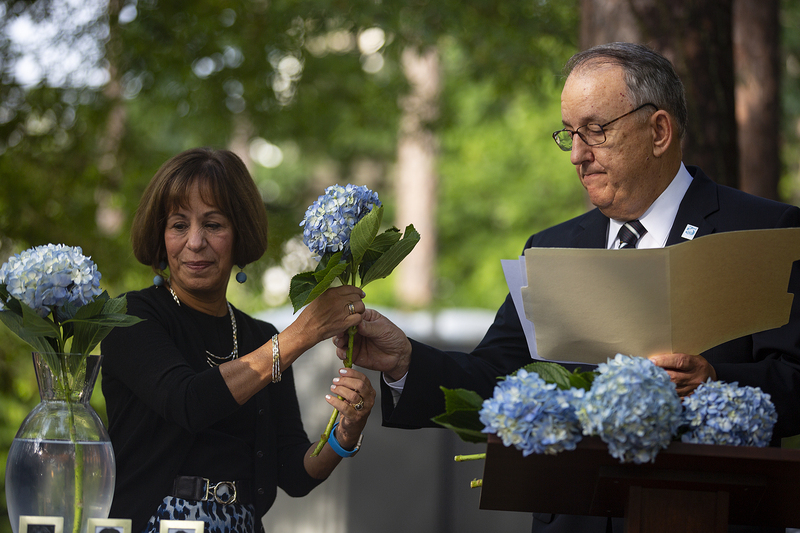 After Dibbert read a tribute, UNC Chancellor Carol L. Folt placed a hydrangea blossom in a glass vase for each of the first five. When they came to the tribute for Quackenbush, Dibbert handed the flower to Melisaratos, who spoke after placing it in the vase. Melisaratos told of speaking at another remembrance ceremony at the National September 11 Memorial & Museum in New York, where before a throng of TV cameras broadcasting to the nation, he nervously had read the names of his uncle and others killed. He said his mother, Dr. Gail Quackenbush ’83 (’88 MD), thanked him for reading her older brother’s name. That day, at that previous memorial, he was living up to that part of his uncle’s legacy, as well. “As we continued to walk back into the museum, multiple people came up to me in tears, thanking me for reading the names of their late relatives,” he recalled. “Although I only replied with a simple, ‘You’re welcome. I’m sorry for your loss,’ I felt such joy knowing that my words could uplift these people and be a balm to their inner wounds. First-year student Dylan Melisaratos, nephew of Christopher Quackenbush ’79, joins GAA President Doug Dibbert ’70 and UNC Chancellor Carol L. Folt during the annual remembrance ceremony for the six alumni killed in the 9/11 attacks. These are the tributes that GAA President Doug Dibbert ’70 delivered at this year’s 9/11 remembrance ceremony. 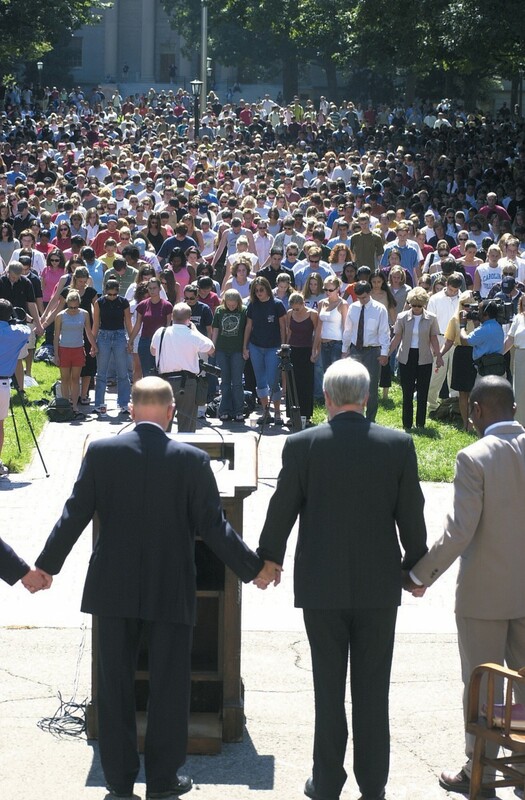 Our University community came together on Polk Place Sept. 12, 2001. And at that time we could not yet know who among our Carolina alumni had been lost. Regrettably, in the days that followed, we learned that we had lost six very special people. They were sons and daughters, brothers and sisters, aunts and uncles, husbands and wives, neighbors, colleagues and friends. And Karleton Fyfe, Mary Lou Hague, Andrew King, Ryan Kohart, Dora Menchaca and Chris Quackenbush were each exemplary Carolina alumni. Two were passengers on separate flights; two worked in the same firm, Cantor Fitzgerald, graduating 15 years apart. One represented the 52 alumni of Kenan­ Flagler Business School who had current work addresses at the World Trade Center. One had ties to Carolina covering at least four generations. As we continue to recall how they died, we should also remember and celebrate how each lived. Karleton Fyfe, class of ’92, rarely traveled on business. He had been working as a financial analyst with the John Hancock Co. for nine months when he boarded American Airlines Flight 11, leaving his wife, Haven, a graduate of the class of ’94, and 19-month-old son, Jackson, behind in their Brookline, Mass., home. Mary Lou Hague, class of ’96, came to Carolina from Parkersburg, W.Va. A financial analyst with Keefe, Bruyette & Woods, she worked on the 89th floor of the second tower in the World Trade Center. Andrew King, class of ’83, also had been at work in the World Trade Center in February of 1993, when the blast at the Twin Towers killed five people and injured about 1,000 others. A partner and currency trader at Cantor Fitzgerald, he walked down the 104 floors to the wintry street below. Andrew commuted 90 minutes each way from his home in Princeton, N.J., where he lived with his wife, Judy, and their three children, Ce Ce, Drew and Carly. He opted for bear hugs over handshakes and got to know people quickly, well and in high numbers. He transferred to Carolina after visiting his childhood friend here. He majored in political science. At his memorial service, speakers noted his unique mannerisms — including his penchant for wearing a Carolina blue Tar Heels cap with orange madras shorts. Others recalled his pride in his Scottish heritage and the kilt he would wear on formal occasions. Ryan Kohart, class of ’98, was a stock trader with Cantor Fitzgerald and never missed a day of work. It was a job Ryan loved. Ryan also loved lacrosse. Having come to Carolina after growing up on Long Island, he majored in political science and was a four-year letterman at UNC, a winner of the Jay Gallagher Award as the UNC lacrosse team’s outstanding freshman. 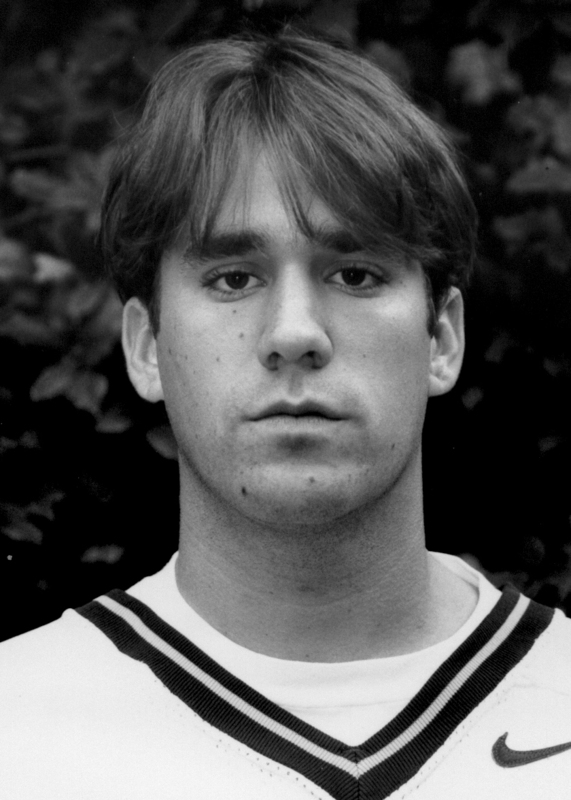 He co­-captained the team in his senior year and played three seasons with his younger brother, Brett [’99]. Ryan, the third of four boys, also loved to read, travel and collect fine wines. In his junior year, he explored Europe through the University’s study-abroad program and was drawn to Florence, Italy. He returned there in the spring of 2001 with his girlfriend, and while there they became engaged to be married. 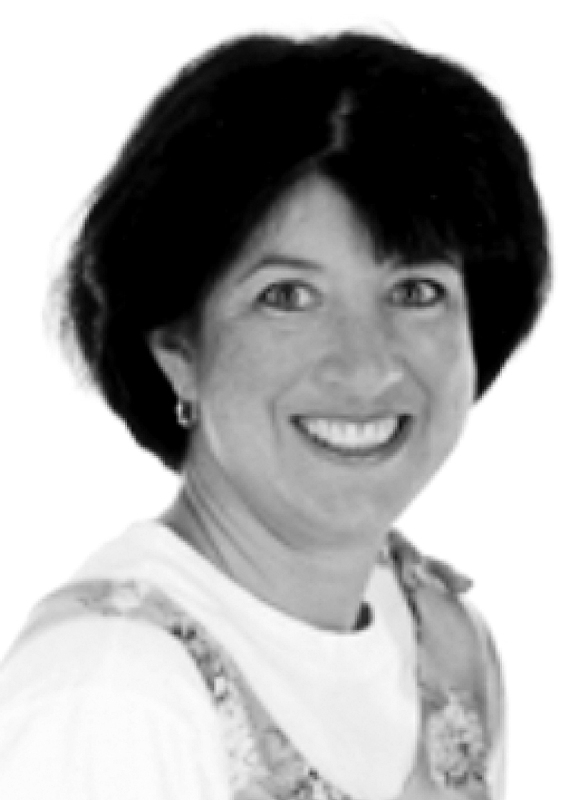 On Sept. 10, 2001, Dora, an associate director for Amgen, a biotech firm, met with U.S. Food and Drug Administration officials. The meeting represented one step in seeking government approval for a prostate cancer drug. When the meetings ended early, Dora called her husband, Earl Dorsey, in Santa Monica to let him know she’d be taking the next available flight. That return flight was American Airlines Flight 77 from Washington’s Dulles Airport, the plane that hit the Pentagon. Dora left behind two children, a daughter, Imani, and a son, Jaryd. Chris Quackenbush, class of ’79, was “a man who wore Armani suits and wore Santa suits,” said his brother Michael, in the class of ’77. As a founding principal in the investment-banking firm of Sandler O’Neill & Partners, with offices in the World Trade Center, he had put his wealth to work for others. Michael recalled his brother saying: “‘I’m the luckiest guy. I have the capacity now and the opportunity to do good things.’” Among those good things was his creation of the Jacob Marley Foundation; each year in its name, he took 600 children to Shea Stadium for a Mets game. Chris served on the UNC Board of Visitors. His family has numerous ties to Carolina, with his parents and three of his four siblings graduating from Carolina; his niece attended Carolina. His grandfather was a professor at UNC, and in 1996, Chris established, in his grandfather’s name, the Albert Ray Newsome Distinguished Professorship for the study of the South. He also endowed a scholarship for women’s lacrosse and contributed to the renovations of Memorial Hall, Finley Golf Course, Kenan Stadium, Navy field and the softball field. Chris, his wife, Traci, and their children — Whitney, “C.J.” and Kelsey — lived in Manhasset, N.Y., the home of 22 of Sept. 11’s victims. Here with us today is his nephew, Dylan Melisaratos, who is a first-year student from New Jersey. I will hand a flower to Dylan to place. Please let us join in a moment of silence in memory of Karleton Fyfe, Mary Lou Hague, Andrew King, Ryan Kohart, Dora Menchaca and Chris Quackenbush. Seldom has Carolina’s campus come to such a stunned halt as it did on Sept. 11, 2001. 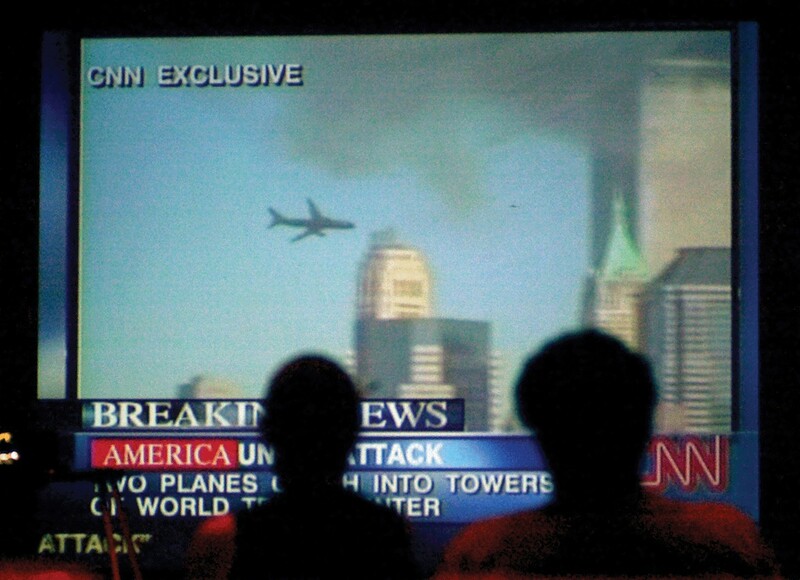 People were glued to TVs watching news coverage, trying to comprehend what was happening. On Sept. 12, some 10,000 people streamed into Polk Place — the largest gathering there anyone could remember — and held hands and listened for words of comfort and hope. Soon word came that six Carolina alumni were among the almost 3,000 who lost their lives in the terrorist attacks. Two were passengers on separate flights; two worked in the same firm, Cantor Fitzgerald, graduating 15 years apart. One represented the 52 alumni of the Kenan-Flagler Business School who had work addresses at the World Trade Center at the time. One had ties to UNC covering at least four generations. 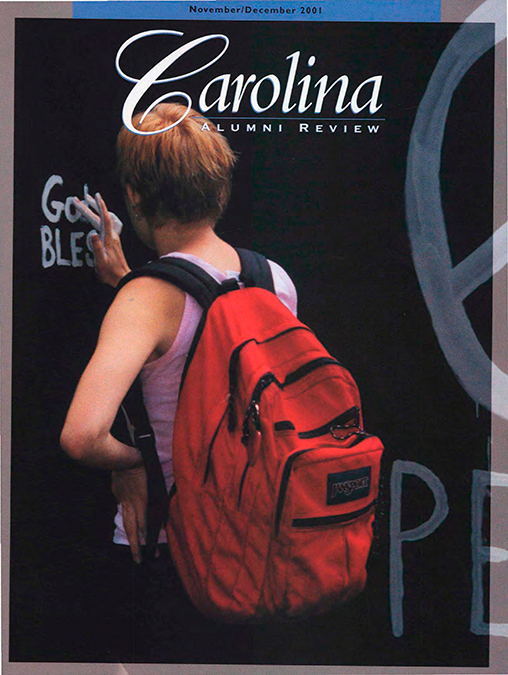 These are the stories of how they were remembered at the time, as reported by editor Regina Oliver ’75 in the November/December 2001 Carolina Alumni Review. Karleton Douglas Beye Fyfe ’92 rarely traveled on business. 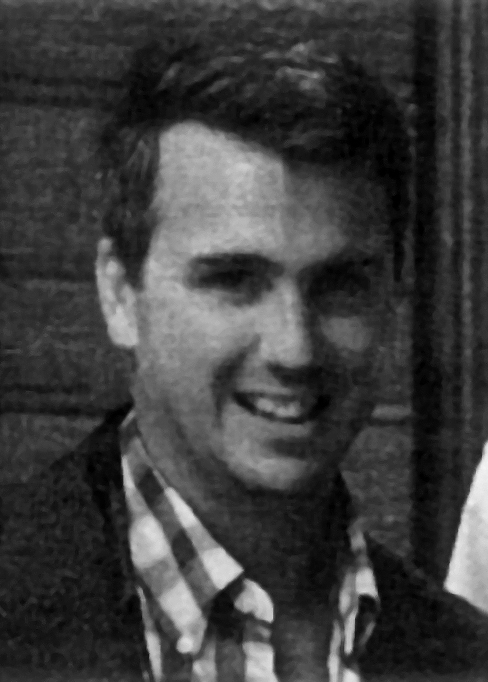 He had been working as a financial analyst with the John Hancock Co. for nine months when he boarded American Airlines Flight 11, leaving his wife, Haven Conley Fyfe ’94, and 19-month-old son, Jackson, behind in their Brookline, Mass., home. Fyfe, who grew up in Durham with his older sister, Tiffany Tanguilig ’89, inspired many people in his 31 years. In the days following Sept. 11, two people who knew him well — his uncle, Bill Tammeus, and a friend from UNC, Eric Schellhorn ’92 (MA) — published essays reflecting on Fyfe’s quiet wit, quick intelligence and unusual ability to say the right thing at the right time. Friends of Fyfe, who was active in the GAA’s Carolina Club in Boston, are preparing to set up a scholarship fund in his name at Carolina. It would go to one student each year of similar whimsy, who double-majors in economics and philosophy. Mary Lou Hague ’96 came to Carolina from Parkersburg, W.Va., a town not unlike Chapel Hill in size. Three years ago, she headed for a much bigger place — New York — and she lived life large. A financial analyst for Keefe, Bruyette & Woods Inc., she worked on the 89th floor of the second tower in the World Trade Center. Her friend and Tri-Delta sorority sister Heather Fain ’96 talked to The New York Times about her friend, about how Hague loved Michael Jackson and spent $1,500 to see him the last weekend of her life. She also loved Michael Jordan; her answering machine code was “23.” The Times featured Hague on Sept. 28 in its “A Nation Challenged” compilation of profiles of the Sept. 11 victims. In Parkersburg, as word spread that Hague was unaccounted for in the World Trade Center disaster, the town was shaken. After majoring in business at UNC and before moving to New York in 1998, Hague worked in Memphis, Tenn. Her friends said she had been thinking she would like to meet a Southern guy, move back to the South and have a dog. On the day of the attack, she made phone calls from Tower 2 after Tower 1 had been hit. One call was to her mother, Liza Adams, to tell her she was OK but scared. Adams called back and said to leave immediately. Hague said she would but then heard that instructions had come over the loudspeaker in Tower 2 for employees to stay where they were. She was very responsible. She stayed. Afterward, Adams went to New York in hopes that her daughter might be alive. She went to the Red Cross and stood in lines with other families who were looking for their loved ones. Two of Hague’s friends and sorority sisters from Chapel Hill — Fain and Elizabeth McWilliams Kimzey ’96 — spent days searching for Hague, filing a missing persons report, posting pictures, going to hospitals and cleaning Hague’s apartment in preparation of their friend’s family. An endowed need-based scholarship to UNC in Hague’s memory has been established by a friend. Contributions, marked for the Mary Lou Hague Scholarship, can be sent to UNC Development Office, Attn: Arthur Gregg, P.O. Box 309, Chapel Hill, N.C. 27514. 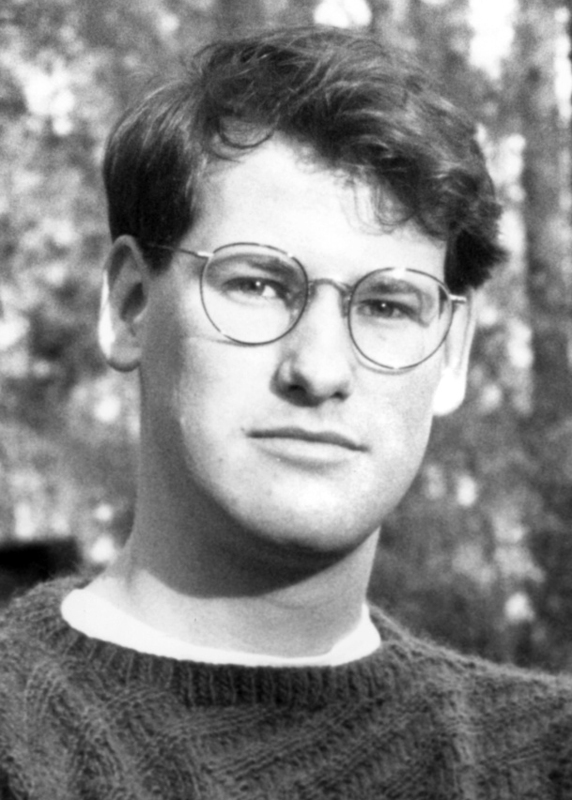 Andrew Marshall King ’83 also had been at work in the World Trade Center in February 1993, when the blast at the Twin Towers killed five people and injured about 1,000 others. King, a partner and currency trader at Cantor Fitzgerald, walked down the 104 floors to the wintry street below. If he ever looked back to that day in concern, his friend from childhood, Phillip Schmitt ’83, never knew about it. He opted for bear hugs over handshakes and got to know people quickly, well and in high numbers. “He accomplished and experienced more in his 42 years than most people do in a lifetime,” Pritchard said. In King’s two years at Carolina — he transferred in after falling in love with the place during a visit to his pal, Schmitt, and majored in political science — he seemed to get to know more people than most students manage in four years, Schmitt said. While citing King’s achievements and commitment to his family and friends, the memorial service speakers also noted his unique mannerisms, the Packet reported. Judson Linville, another friend of the family, recalled King’s penchant for wearing “a Carolina blue Tar Heels cap” with orange madras shorts. “And then there was the kilt,” Linville added, drawing laughter from the attendants, who recalled King’s pride in his Scottish heritage and the kilt he would wear on formal occasions. Ryan Kohart ’98 never missed a day of work. That’s how Geoffrey Kohart knew, in the aftermath of the attack on the World Trade Center, that his 26-year-old son, a stock trader with Cantor Fitzgerald, was gone. It was a job Kohart loved, his father told The Durham Herald-Sun. He was in his office on the 104th floor of the World Trade Center’s Tower 1 when the hijacked aircraft struck the tower. “When I saw that it happened, I said to my co-workers, ‘Oh my God, Ryan’s up there.’ They said that maybe he didn’t go to work that day, but I knew he never missed a day of work,” Kohart told The Herald-Sun. Kohart also loved lacrosse. Having come to Carolina after growing up on Long Island, N.Y., he majored in political science and was a four-year letterman at UNC, a winner of the Jay Gallagher Award as the UNC lacrosse team’s outstanding freshman in 1995, and he co-captained the team in his senior year. He also played three seasons with his younger brother, Brett Kohart ’99, who followed him to Chapel Hill and played from 1996-99. His family has created a memorial scholarship fund to help a future UNC lacrosse player. His father told The Herald-Sun that it is a scholarship that Kohart himself planned to create one day. Kohart, the third of four boys, also loved to read, travel and collect fine wines. In his junior year, he explored Europe through the University’s study-abroad program and was drawn to Florence, Italy. He returned there a few months ago with his girlfriend, Melissa White, and while there they became engaged to be married. Kohart’s father also recalls his son’s passion for Carolina football. Just before the kickoff of UNC’s first home game against Florida State, the nearly 60,000 fans in attendance stood quietly in a moment of silence for Ryan Kohart. Contributions to the Ryan Kohart Memorial Scholarship Fund may be sent to The Educational Foundation, care of Sue Walsh, UNC, P.O. Box 2446, Chapel Hill, N.C. 27515. On Sept. 10, Menchaca, an associate director for Amgen, one of the nation’s leading biotech firms, met with U.S. Food and Drug Administration officials. The meeting represented one step in seeking government approval for a new prostate cancer drug. When the meetings ended early, Menchaca called home to her husband, Earl Dorsey, in Santa Monica to let him know she’d be taking the next available flight. “Whenever they had a product that was close to approval, Dora would make the trip to Washington” to meet with the FDA, said Dorsey in a story reported by Newsday. That return trip was on American Airlines Flight 77 from Washington’s Dulles Airport, the plane that hit the Pentagon. “I was watching the accounts on TV, and I knew that Dora was on the flight,” Dorsey said. Later that day, his fears were confirmed. The couple, who met when they were both graduate students at UCLA, have two children, daughter Imani, 18, who is a freshman at the University of Portland, and son Jaryd, 5. “Dora enjoyed being home, working in her garden and making our house into a home,” Dorsey told Newsday. More than 500 people attended a candlelight vigil at Grant Elementary School, where Menchaca’s son has just begun kindergarten, in honor of Menchaca and the other victims of the terrorist attacks. Christopher Quackenbush ’79 was “a man who wore Armani suits and wore Santa suits,” his brother, Michael Quackenbush ’77, recalled in an interview with The Durham Herald-Sun. As a founding principal in the investment banking firm of Sandler O’Neill & Partners, with offices in the World Trade Center, he had put his wealth to work for others, an attribute recalled many times by his friends and family in the weeks since Sept. 11. “He really got a sense of joy out of it,” Michael said. Sandler O’Neill also has a reputation for community service and support of one another. When the firm reopened for business on Sept. 17, Jimmy Dunne, a managing partner, had a sign on his door: “Chris Quackenbush, missing, born Jan. 5, 1957, 195 pounds, 6 feet 4,” according to a Newsday article. The things Chris did included serving on UNC’s Board of Visitors; his term ran through 2003. His family has numerous ties to Carolina, with his parents and three of his four siblings graduating from Carolina; his niece is a sophomore here now. His grandfather was a professor at UNC, and in 1996 Chris established, in his grandfather’s name, the Albert Ray Newsome Distinguished Professorship for the Study of the South. Newsome had been a history faculty member for nearly 20 years at UNC and for 16 years had served as department chairman. “He was tremendously giving and philanthropic, and he loved Carolina,” said Arthur Gregg from UNC’s Development Office. “He believed strongly in giving back.” Among his more recent interests at Carolina was the restoration of Memorial Hall. He also endowed a scholarship for women’s lacrosse and contributed to the renovations of Finley Golf Course, Kenan Stadium, Navy field and the softball field. Chris, his wife, Traci, and their children — Whitney, 11; Christopher James “C.J.,” 9; and Kelsey, 6 — lived in Manhasset, N.Y., the home of 22 of Sept. 11’s victims.“We’re talking soccer fields with lots of dads missing. There was such an intensity of loss,” Michael said. He estimated 2,000 people attended his brother’s memorial service. In his “Yours at Carolina” column in that issue of the Review, GAA President Doug Dibbert ’70 wrote of the atmosphere in the immediate days, as well as the coping that followed, how it reminded him of past events in his life, both as a student at Carolina and a particularly tragic time for his family years before. Quietly, reverently along with 10,000 others, I departed Polk Place. Such a peaceful, silent adjournment of so many from this otherwise vibrant, active space was surreal, but then that which prompted this gathering of the University community was even more surreal. I am referencing, of course, the poignant responses to the tragic events of Sept. 11. Standing with others, holding hands, listening to the comforting words of our chancellor, our student body president, a campus minister, a professor and others, my mind raced. The tragedies that brought us together and the size of the gathering prompted me to recall a spring 1970 Polk Place vigil in the aftermath of the deaths of four students at Kent State subsequent to the U.S. incursion into Cambodia as the war in Vietnam raged. Outside Old East I happened upon our older son, and we chatted about his own reactions and thoughts. He had been in touch with a friend and UNC alumnus who works for a U.S. senator; one of his roommates shared reactions from friends in Israel. In the Alumni Center, the day of the attack we connected with the two alumni tours traveling in Europe, prepared to open our online alumni directory to all alumni, students and others connected to Carolina who visited our Web site (not just GAA members) and began to put together a panel of UNC faculty for a Thursday evening GAA program entitled “Understanding the Attack on America: A Public Forum.” And we waited. We waited for that which we knew would follow but which we wished our Carolina family could be spared. 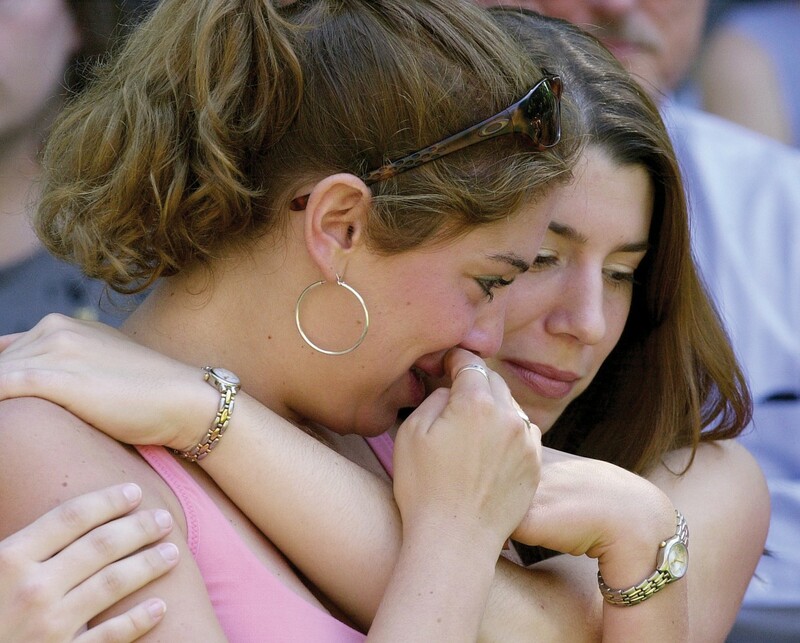 We waited to learn the names of former Carolina students who perished on Sept. 11. 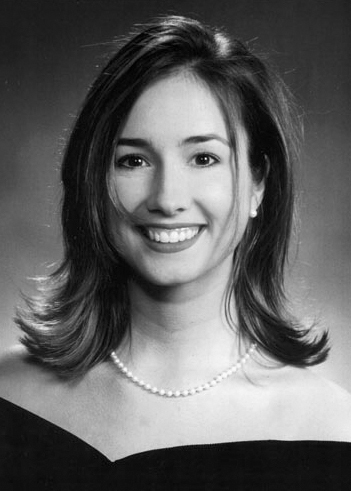 All too soon we learned that two of our graduates died aboard two separate flights, and in the following days we learned that four more Carolina alumni were victims in the World Trade Center. As we learned their identities, we marveled at the courage of the firefighters, police officers, rescue workers and others in New York and at the Pentagon and of the bravery of passengers aboard United Flight 93 who denied terrorists a fourth target. That which haunted me in the early hours and days after the attack remains unshakable. Time and again I have flashed back to June 1, 1965. On that bright, Friday afternoon, a cab driver delivered a telegram to my mother at our Fayetteville home. That telegram conveyed the tragic news that my dad had been shot and killed in an ambush near Pleiku, South Vietnam. Later that afternoon, at age 17, I shared this news with the youngest two of my four younger brothers. That single bullet forever changed the lives of my mother and each of her five young sons. On Sept. 11, all of our lives changed. And while we understandably will continue to search for answers and seek to determine the implications for our country and the world, for now we continue to ache for the sons and daughters, husbands and wives, parents and grandparents who lost family members. Without warning, without a telegram, with the entire world watching, these families received horrific news, which immediately changed their lives forever. It was not until I accompanied our own sons as they visited other campuses before choosing to come to Carolina that I remembered that my dad was unable to take me on any campus tours. That made these trips very special for me. My dad never met my wife nor his grandchildren. Dad was not around to share in my accomplishments or to console me in my disappointments. And now an estimated 10,000 children are without a parent as a result of the attacks of Sept. 11. For nearly 20 years I have written this column, and no column has been more difficult to write. I convey these personal reactions because I think each of us is dealing with the events of Sept. 11 on a personal basis. We should be proud that our Carolina community again came together and continues to provide an environment for the expression of all views and opinions during this national tragedy. This is the Carolina way. On Sept. 13, the General Alumni Association hosted a public forum, “Understanding the Attack on America,” attracting more than 700 people and bringing together prominent UNC experts in American foreign policy, business and finance, psychology, political science, national defense and military policy, and Middle East studies to discuss their views and those of the audience in response to the ever-swirling events surrounding the attack. In welcoming the audience and introducing the panelists, Doug touched on the particular role a university community can play in such circumstances. Listen to a recording of the forum (1:46:57). 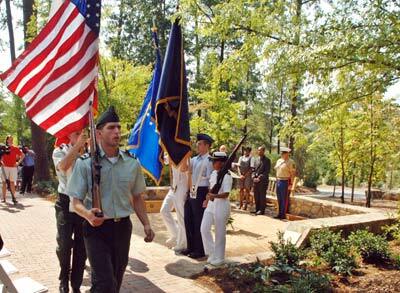 Read all the November/December 2001 Review’s coverage of the impact of 9/11 at UNC. The next year, at a campus convocation back on Polk Place on the first anniversary of the attacks, Doug again reflected on the impact of the tragedy and the loss of those alumni. Doug ended by invoking music that has often united and comforted the Carolina family. Say nice things about me, carry on without me. At the anniversary remembrance in 2007, the class of 2005, which had just begun its freshman year when the attacks occurred, dedicated a memorial on Stadium Drive near the George Watts Hill Alumni Center as its gift to the University. Read about the ceremony. At the 2011 remembrance, it was hard to believe a decade had passed. The loss still seemed fresh. Can it now already be almost another decade beyond?